Previous Experience is Not Necessary to Own Your Own Mobile, Onsite Services Business in the Automotive Industry! There's Massive Market Most vehicles on the road today have suffered some form of paint damage, whether it is chips, scratches, bumper dents, scrapes, or cracks. Collision on Wheels, Inc.® certified technicians are trained in techniques and processes that result in excellent repairs at a cost-savings our retail customers can appreciate. Why repaint an entire panel or replace the entire bumper cover when a professional spot repair will do the job at a fraction of the cost without customers having to take their vehicle anywhere? Our primary market is retail service for individual car owners but we also service fleet managers and car dealerships. By offering mobile services, Collision on Wheels, Inc.® saves our customers hundreds of dollars, compared to a traditional body shop. Our professional staff will support you every step of the way with complete sales, management and technical training. You don't need to have any experience or background in the automotive business. And when you introduce your Collision on Wheels, Inc.® business to consumers in your area, we'll be there with you. You'll learn first hand, from the pros, how to sell the quality and competitive advantages, and overcome any obstacles. That's the kind of support you can take to the bank! 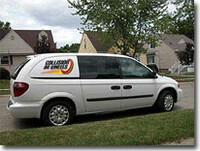 Collision on Wheels, Inc.® fills a unique and high-demand segment of the automotive repairmarket. We specialize in repairing vehicles at the customer's site. We bring a fully-equipped van and a trained automotive collision technician right to the customer, where the work is done, onsite and to the customer's satisfaction. Previous industry and business ownership experience is not necessary to join us. Our professional staff will support you every step of the way with complete sales, management and technical training. We even provide all of our franchisees with a professionally maintained customer call center and we book all of your customer appointments for you so you can concentrate on building and growing your business. No automotive background is needed to own a flexible, mobile business in this booming industry!